Sometimes manpower (and even woman-power) isn't enough to get the job done. That's when you need robots. 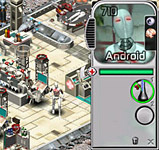 Space Colony includes three types: industrial robots, military robots and androids. Industrial Robots - These include resource-gathering robots, such as silicon dozers, iron- and titanium-mining robots, scavengers and nutrient harvesters. They cannot be purchased separately but come with the larger resource-gathering units. If one of these robots is damaged, it can be fixed using an engineering repair facility. If an industrial robot is destroyed, a replacement can be built using a industrial robotics factory. Smaller industrial robots include warehouse, repair, butcher, pharmaceutical and seeding droids. These are part of the warehouse, engineering repair facility, chicken farmer unit, pharmaceutical extractor and bio research lab, respectively, and are not treated separately from their parent units. Military Robots - These include dogbots, soldiers and commandos, all of which are available by clicking the military systems button. When you buy a military robot, you purchase its post and place it outside your base. It's a good idea to keep robot posts in a protected area. Damaged military robots can be repaired using an engineering repair facility. Or, if a robot is destroyed, a replacement can be built using a military robotics factory. But if the robot's post is destroyed, the robot is lost too, and you must buy a replacement. It is possible to own a maximum of 12 military robots, which may be any combination of dogbots, soldiers and commandos. To monitor and control your military bots, click on the robot soldier icon above the group of colonist icons along the bottom of the screen. * This centers the view on the first soldier. Click on the soldier icon repeatedly to view every military robot in turn. Doing this also brings up the soldier panel with info about that particular robot (an example is shown at left). The soldier panel is similar to the colonist panel though simpler, since soldiers don't have relationships, needs, etc. Their only indicator bar is their repair status (colored bar with red cross icon). The soldier panel also has up to 12 small, square buttons represending every military robot available. (In the sample screen, there are 6 soldiers available.) To control your robots from here, click these buttons to select and de-select each robot. Then direct their movement by clicking on the ground where you want them to go, or click the red button on the soldier panel to send the selected robots back to their posts. Military robots will shoot at the nearest enemy automatically. They cannot shoot while moving, however. If you want to direct them to shoot at a particular target, first move them within range. Then select the robot(s) you want to shoot. Then click on the target. Building & Managing Androids - Androids are semi-intelligent humanoid robots produced in a cybernetics lab. They are "born" with training in every available skill, and they work tirelessly under any conditions, making them valuable additions to any colony. Creating an android requires 1 unit of iridium, 5 advanced electronics, and a trained operative to run the lab. The more cybernetics training the operative has, the more quickly the android will be manufactured, the more skill the android will have in all areas, and the longer that android's life will be. Once an android is created, it will go to the bridge and await instruction. It can be assigned to perform various tasks the same way you'd assign a human colonist. Its skill level (number of stars on all badges) is determined by the android-production skill of the person (or other android) who created it. Androids cannot be given additional training. To monitor your androids' work, click on the android icon above the group of colonist icons along the bottom of the screen. This centers the view on the first android. Click on the android icon repeatedly to view every android in turn. Doing this also brings up the android panel with info about that particular android (an example is shown below). The android panel is identical to the colonist panel except that androids don't have relationships, needs or moods. Their only indicator bar is their repair status (colored bar with red cross icon). Also, the number at the top left of the portrait indicates their remaining lifespan. Once its lifespan clock runs out, the android will break down and disappear. 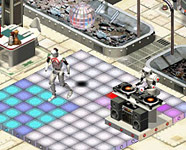 Androids can also use some of the same facilities your colonists do. It seems they even enjoy dancing (above). Just be sure not to send them to the hygiene pod, which will cause them to short out and be destroyed. * NOTE: The soldier icon above the colonist icons at the bottom of the screen is only available in the patched version of the game. See the Space Colony v. 1.1 Patch page for more info.